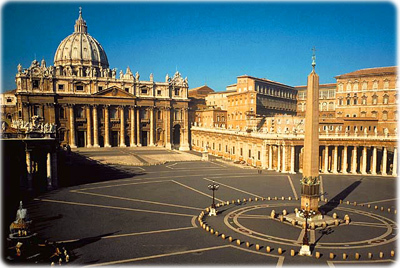 Vatican City is an ecclesiastical state, the smallest country in the world, with only 44 hectares. It is an enclave in the north of Rome. Its name comes from one of the seven hills of the Italian capital. Vatican City is the center of the Roman Catholic Church and the location of the Apostolic Palace, the Pope's official residence. Although the Vatican City area had been donated to the Church by Pepin the Younger, king of the Franks, in 756 AD, the State of the Vatican City was only officially constituted by the Lateran Treaty, which was signed on February 11, 1929 by the Italian dictator Benito Mussolini and Pope Pius XI. Since the establishment of the empire of Charles the Great, in the 9th century, Popes have ruled the Church from central territories in Italy or in Avignon, in South of France. As Italy became gradually unified, the Church lost big areas of land, the Papal States. In 1870, troops led by King Victor Emmanual II invaded Rome and annexed the city to the newly unified Italian state. Pope Pius XI refused to recognize the annexation and incited the Catholics not to vote in the elections, even after Victor Emmanual II had offered to pay indemnification and promised to keep him as head of the Vatican State. It was the beginning of the "Roman Question", a political dispute which was only solved almost 60 years later, when Italy acknowledged the sovereignty of the Holy See over that piece of land. Vatican was then declared a neutral and inviolable territory. The terms of the Lateran Treaty were ratified by the Italian Republic, established in 1947. 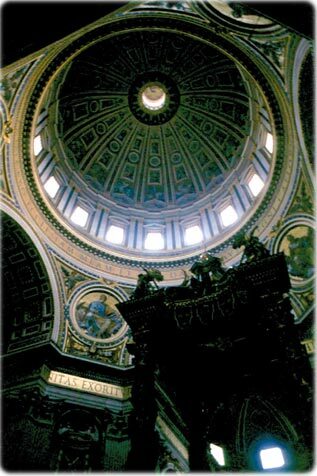 Saint Peters Basilica, Holy See. Saint Peters Square, Vatican City.